Once you’ve decided that you want to send your game to a publisher then the next step would be to create what we call a Sales Sheet. A Sales Sheet is a one-page document that gives a quick overview of your game to a potential publisher. To some this might seem superfluous, but to us, we credit a lot of our success to having these Sales Sheets ready. Showing a clean looking Sales Sheet to a publisher immediately tells them that you are professional and you know what you’re doing. When I attend board game conventions and approach a publisher’s booth to ask them if they are accepting submissions, I often get an ‘eyes-rolling’ kind of vibe as they begrudgingly say “ok sure.” Then when I pull out my Sales Sheets, I can actually see a visible change in attitude as they immediately realize that they’re dealing with someone who’s serious about game design and not someone who has designed the next Monopoly clone. Here’s an example of one of our Sales Sheets for our game Jungle Jam (which has since been retitled to Jam Slam, but we haven’t updated our Sales Sheet yet!). Our newer Sales Sheets have a lot less text, but this one had all the major points on it that I wanted to cover. See bottom of post for an example. 1. The logo might seem challenging to you if you don’t have artistic skills, but you really don’t need a lot of skills to create a logo. Google ‘how to make a logo’ and you’ll find a bunch of resources to help you. The main key is that your logo should have the same energy that you want your game to have. If your game is a quick reaction game then your logo needs to be playful and punchy; but if your game is a serious game about trading antiques then an old fashioned feel is obviously better. 2-4. The next three can be combined into a graphic similar to what we see on published board games. If there are ways to remove or reduce text on this page, then do it! 6. The publisher should already know what kind of game it is, but most games have subsets of categories that it could belong to. Our upcoming game, Belfort is a Resource Management game, but it also has Worker Placement, Area Majority and Building as subset categories. It’s beneficial for a publisher to know which categories your game fits into as they could be looking for an Area Majority game. Conversely they could be full up on Area Majority games and will want to pass on your game – but it’s better to know that sooner rather than later anyway. 7. A publisher is always looking at the bottom line so a list of contents will help them understand if it’s a game they can make with a profit or not. Hopefully your game is as lean and clean as possible so you don’t scare off any publishers with a ginormous list of contents. 8. If you can include actual photographs of your game instead of just computer based samples, then it will go a long way to show the publisher that there is a full prototype ready to go. Just like when we look at a game we might want to buy from a game store, the image on the Sales Sheet would be better if it shows the game in progress. 9. It’s even better if you can use this image to show an example of one round of play. This part can be challenging because think about what everyone’s least favourite part of playing board games is…it’s reading the rules. So don’t just put a rules summary in your sales sheet. The publisher doesn’t need to understand why Player A did what they did – the publisher just needs to know how some of the mechanics work together. Here are a couple examples. If you can find any sales stats that support why your game will do well, then that’s perfect! 11. Obviously don’t forget to put your contact info on it! Once complete you are now ready to approach publishers. We’ve found that whether we’re approaching a publisher in person or via email, we’ve used our sales sheets almost every time. In an upcoming post we’ll talk about the importance of conventions and how these Sales Sheets are invaluable to us as designers. Here’s an example of a newer Sales Sheet that is more show and less tell. 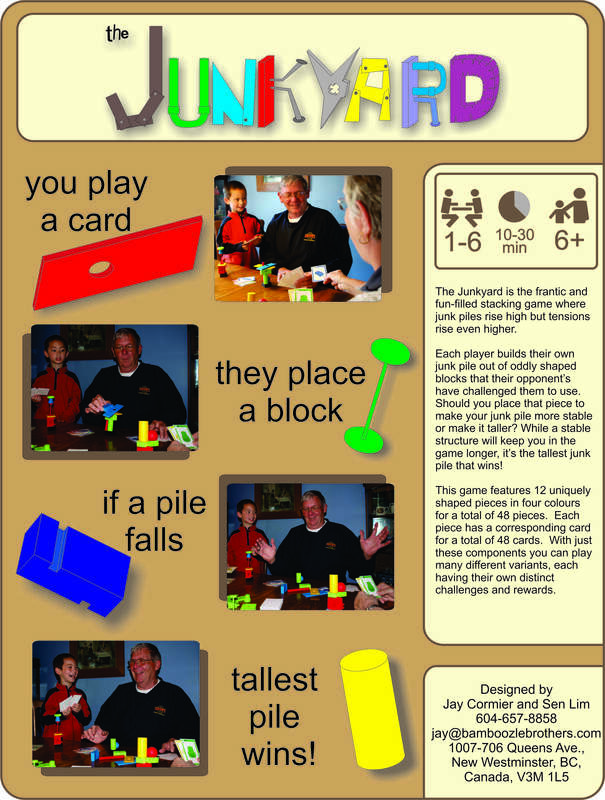 It works well for this kind of family game and this was what was used to show to Mattel and Hasbro. Not much more to say except treat your sales sheets like your “business cards with a bang”. You want something to leave people with that says more than just your name/contact info/website. You want to leave them with the impression that you are professional, that you’ve got a prototype ready to play at the drop of a hat, and that you’ve put a lot of thought into the product you’re pitching. 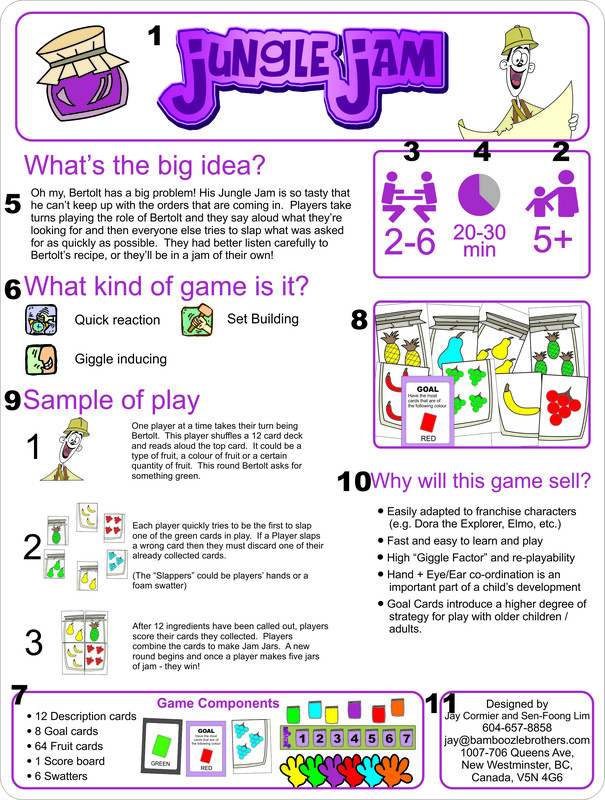 Short of giving the publisher a working prototype, you want them to be able to get the gist of your game – the general rules, the look and feel, the target demographic – with as little effort on their part. The less amount of time they have to spend scouring the internet, calling you, chasing you down the better for you. The sell sheet is your foot in the door when your foot isn’t even nearby. Publishers will take the countless sell sheets they’ve picked up from a convention and sift through them, hoping to chance upon the next SdJ. Make sure your game is poised to be picked up by making a sell sheet that helps them remember everything pertinent about your game without overloading them. Give them confidence in your product by creating a well-presented, succinctly worded sell sheet. The time spent making the sell sheet and handing it out will pay dividends if it’s done right.